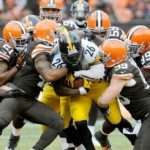 The Pittsburgh Steelers are desperate for a win after four-straight losses and now they head to Cleveland to take on the rival Browns are winless on the season. 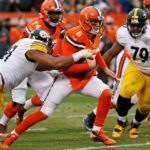 What You Need to Know: The Steelers have lost four-straight games… Pittsburgh is 0-5 on the season when they trail after the third quarter… Ben Roethlisberger is 19-2 all-time against the Browns… Big Ben needs six completions to pass Fran Tarkenton for 12th on the all-time completions list… Antonio Brown will set a record for most TD receptions by a Steelers with his next one… He needs five receptions to reach 600 for his career. What’s at Stake: The Steelers are coming apart at the seams and need a win to break the four-game losing streak. With division-leading Baltimore in Dallas, this could be a perfect opportunity to pull even with the Ravens. It’s Time to Get Offensive. The offensive line of the Steelers has underwhelmed this season for the most part especially when it comes to dictating the action. That needs to change versus the Browns who possess the 31st worst run defense in football. I need to see the OL getting off the ball and getting after people and I need to see Le’Veon Bell giving out punishment as he makes his way through the line. Ramon Foster and David DeCastro can need to be the hammers to get his thing rolling in what should be ugly weather made for running the ball. Someone Has to Step Up on D. With Cam Heyward out for the season, someone on the defense has to lead this unit. Normally I would point to Lawrence Timmons or James Harrison but I think the guy we’d all like to see take this role is Ryan Shazier. What Shazier can do is lead by example by making plays and wrapping up defensively. He can lead vocally by getting guys in the right spots making sure guys are accountable for what they are doing. Bottom line is that he’s been around long enough and its time for him to take the next step at being a leader on this team. Make the Weather Your Friend. With high winds expected, Mike Tomlin has to be judicious with his decisions in terms of the coin-flip, field goal/PAT attempts and punts. He’ll get a good idea during pregame warm-ups but he and Danny Smith will have to monitor the conditions as the game progresses. With the longer PAT, I expect that to weigh into his thinking after touchdowns. He must also think wisely when it comes to fourth and short situations around mid-field. There will be times to play it safe and times to throw caution to the wind. Tomlin can’t afford to get these wrong. The Steelers are fighting several demons in this game. A four-game losing streak, questions about the division in the locker room, the weather conditions and the dreaded “lesser team on the road” issue that has plagued them in recent years. They have to recognize that this is a Super Bowl of sorts for the Browns who have yet to win a game. This would make an otherwise awful season bearable for them if they win. This game to me has Le’Veon Bell written all over it but it won’t be easy.